In Star Wars: The Last Jedi, Rey and Kylo Ren battled over possession of Luke Skywalker's lightsaber, only for the weapon to be destroyed. During a recent episode of The Star Wars Show, a closeup image of the prop might confirm that Rey will have to construct a new weapon in Star Wars: Episode IX. While touring Lucasfilm's headquarters, the show's hosts offered a look at the prop lightsaber used in The Last Jedi. Host Andi Gutierrez referred to the item as "broken," which fueled speculation about the relic. However, Gutierrez then confirmed on Twitter that she wasn't an official source of what is or isn't canon. "Another fan reached out to me yesterday with the same image," the host shared. "The crystals in the prop on display are very jagged, so my brain went straight to 'broken.' I agree that it's most likely broken at that juncture & we're seeing the two crystals." Members of the Lucasfilm Story Group, who are considered the definitive sources of what is or isn't canon, offered their input. Leland Chee shared on Twitter, "Looks broken to me. What you can't see in the video is that the shattered fragments of the broken Kyber crystal are blue." 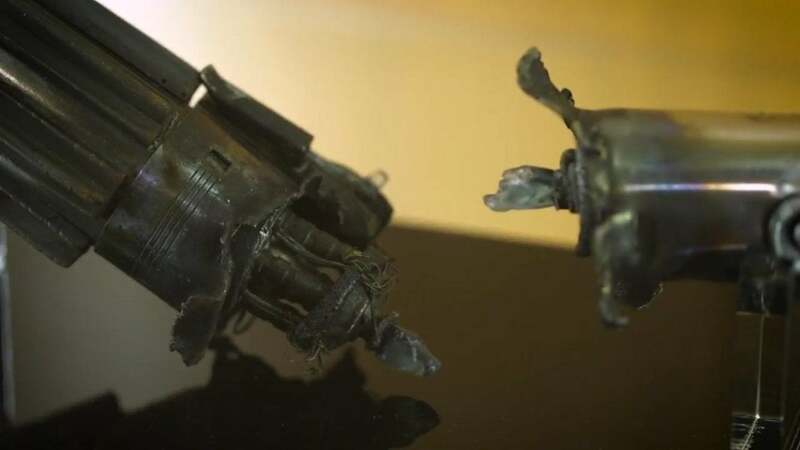 Pablo Hidalgo, however, pointed out, "Also, check the movie, as the prop was digitally altered in post," implying that even this physical artifact might not be the best representation of in-world canon. What makes all of this speculation fascinating is that a key step in becoming a Jedi is constructing your lightsaber with a Kyber crystal. Were the crystal intact, Rey could repurpose it to construct her own lightsaber, continuing the legacy of Luke Skywalker. If the crystal is destroyed and unusable, this would require Rey track down a crystal of her own. After Luke lost this lightsaber in Star Wars: The Empire Strikes Back, we saw that he had crafted a new weapon for Star Wars: Return of the Jedi, without much explanation of how he came to construct the weapon. The question arises about whether Rey's journey to find a new crystal will be part of the narrative of Episode IX, or if she'll start the film with the new weapon. Reports emerged earlier this year that Episode IX had been filming in Jordan, which previously served as a filming location for Jedha in Rogue One: A Star Wars Story. This could mean the new film will feature Rey going to the holy site that was home to the crystals as part of her evolution as a Jedi. How Rey builds her new saber is yet to be determined, though we'll likely see her display the Jedi weapon when Episode IX lands in theaters in December of 2019. What do you think is the status of the crystal? Let us know in the comments below or hit up @TheWolfman on Twitter to talk all things Star Wars and horror!